Home > Family, Travel	> Good News, Bad News: Travel Dept. Good News, Bad News: Travel Dept. 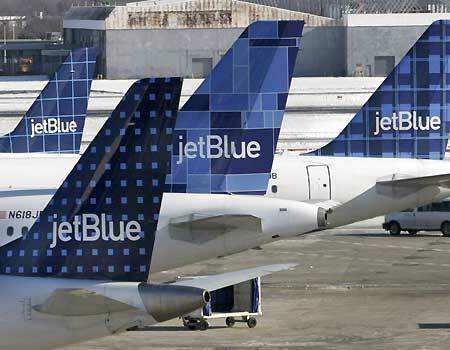 Joel is flying JetBlue to Raleigh-Durham Airport today, via Boston. The connection was pretty tight: due in to Logan at 6:39 PM and due out at 7:05 PM. Normally he travels with just carry-ons, but since the point of the flight is that he’s moving to NC for a while, he had a little more to take along than usual. We were speculating last night about the odds of the checked bag making it on the second flight. This morning, before we headed to the airport, the flight out of Seattle was listed as on time. After we dropped Joel, when I checked on my mobile phone, it was listed as an hour late. Then, when we got home, Joel texted that he was sitting on the plane, just a few minutes past departure time, and indeed JetBlue had revised the online information to show that the flight was just 20 minutes late. A little later, I got another text that the plane still hadn’t taken off. It spent about an hour on the taxiway. Hours later, when I checked to see where the plane was, it had reached western Massachusetts. I then watched — through periodic updates of the map — as it made a big circle over the western and central parts of the state. Finally, it landed about an hour and a half late. That’s the bad news. The good news? Joel’s connecting flight out of Logan (where he is now) is scheduled to depart five hours late, at midnight, landing in Raleigh-Durham at 2:00 AM. How about that? Is he lucky or what? We’ve been spoiled. Not counting his three and a half months in Grenoble, Joel has always lived a non-stop flight away from Seattle. This connecting flight thing is going to take some getting used to.